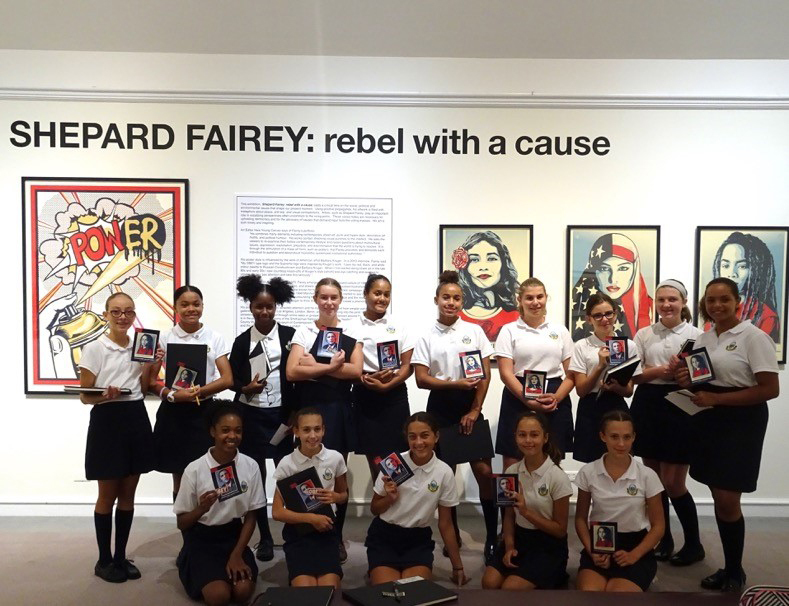 The Green Family have launched a new initiative that will provide free transportation for all public school students to visit Bermuda National Gallery’s [BNG] Shepard Fairey exhibition, on loan from the Green Family art collection. The exhibition, Shepard Fairey: rebel with a cause, is a collection of artwork by the contemporary street artist’s work, including the iconic Barack Obama “Progress” and “Hope” prints. The artist creates work to advocate for the protection of human rights, from the abuse of political power and militarism to the support for minorities and gender equity. The BNG hopes that the exhibit will inspire students to engage in critical thinking, make global connections, politically and socially, to understand the importance of activism and learn how art can be an agent of change. While some schools have already visited, feedback from others suggested that logistical issues were preventing many schools from getting to the gallery. The BNG and the Green Family have collaborated to ensure that the exhibit is accessible to all students. The Green Family will be providing buses to transport public school students to the gallery, and BNG will be providing school tours to all schools. This initiative is possible with the support of the Ministry of Transport and Regulatory Affairs. Since this initiative was announced to the schools on Friday, November 3, more than 1,700 students have been signed up to visit Bermuda National Gallery on the transport provided by the Green Family, and feedback from schools has been overwhelmingly positive. Curator Sophie Cressall says, “As a contemporary art museum, Bermuda National Gallery actively pursues exhibitions that address topical matters, engage a wide audience, and instigate conversation and creative expression. Anybody else want to chip in to send Walton Brown to have a look at this? In a global and increasingly connected world being a well rounded individual is essential. Education and the arts are a large contributor to helping us understand others. Thanks to the Green family for making it possible for all students to attend this exhibition and for making these works available for us all to enjoy.